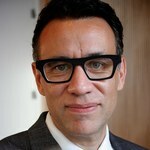 Fred Robert Armisen is an American actor, voice actor, writer, producer, director, singer, musician, and comedian. Widely known as a cast member on Saturday Night Live from 2002 until 2013, Armisen has portrayed characters in comedy films, including EuroTrip, Anchorman, and Cop Out. With his comedy partner Carrie Brownstein, Armisen is the co-creator and co-star of the IFC sketch comedy series Portlandia. Armisen founded ThunderAnt.com, a website that features the comedy sketches created with Brownstein, and is the bandleader for the Late Night with Seth Meyers house band, "The 8G Band".